Cortana isn't just there to refuse opening the pod bay doors, and looking up the answers to fun facts. Always involved in the enterprise sector, Microsoft recently integrated Cortana with Power BI. Cortana took another bold step into the enterprise today. I learned about the move from Frederic Lardinois’ TechCrunch article covering Microsoft’s announcement of Cortana’s integration with Power BI. I’d written previously about the Cortana Analytics Suite, which enables organizations to apply machine-learning algorithms to their data to produce valuable insights. In comparison, the Power BI and Cortana integration seems to be lighter weight and more readily accessible. 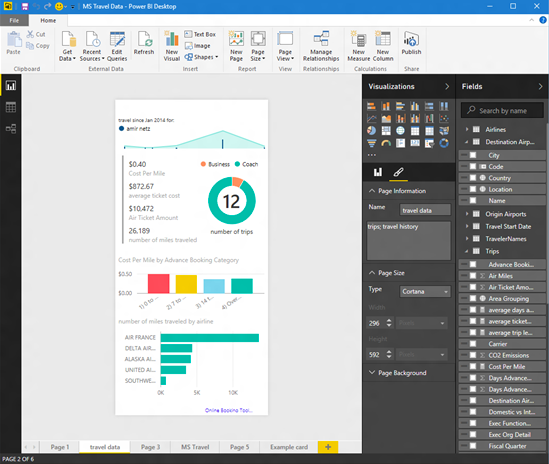 Microsoft offers a scaled-down version of Power BI for free and it can easily be linked to datasets from Excel spreadsheets to enterprise systems. Power BI takes data from your sources and presents it in meaningful dashboards, reports, and datasets. When Cortana is integrated with Power BI, it expands the tool’s capabilities to provide something akin to a personal data assistant. Power BI already had a natural language search feature called Q&A. Now Cortana leverages Q&A to answer questions intelligently. That means you can ask Cortana data-related questions instead of painstakingly creating and executing ad-hoc queries. For example, you can ask Cortana to show you the average spending of customers in Florida by city. Without Cortana, you may have had to build your own query to mine this information from various datasets. With Cortana, your voice-enabled assistant creates the query for you on the fly and presents you with the results. That’s a significant time saver. It can also help you avoid fat finger errors. You can ask Cortana questions with either voice or by typing. Cortana’s new abilities as a data analyst are impressive. Thankfully, we humans are still in charge of coming up with the questions that need to be answered.